The Bees Knees - A Quilting Bee: October Spotlight - Nedra! Hi Everyone, this is Nedra Sorensen from Gilbert, Arizona! 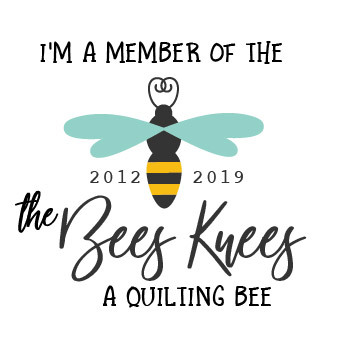 I am an Original Member of the Bee’s Knees Quilting Bee that started wayyyy back when, in fact I submitted the name for our Bee. I love being part of this group and learn something new with every year. 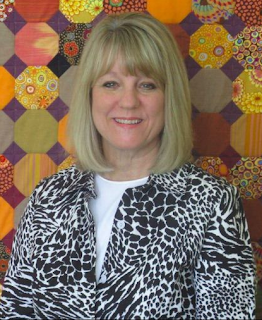 I began quilting in 2000 and now work within the Industry doing a variety of things. I help a Designer get ready for Quilt Market by piecing and binding many of her quilt tops with her latest fabric lines and patterns. I also help a Vendor get ready for Shows, plus work her Booth at several National Shows throughout the year. I love what I do! I find most of my Inspiration through Instagram, and being part of several local quilt groups, including the Phoenix Modern Quilt Guild. Quilty friends are the Best! My favorite place in the World was being able to visit Israel and to feel the Culture and to walk the paths of our Savior Jesus Christ. I’m passionate about Family History, and along with quilting work on it a little bit every day. These are the people who contributed to everything I have and enjoy, and I feel a tremendous pull to remember and honor them. My favorite movies are the Classics, when life was a little more simple and clean. I often quilt by Amazon, Netflix or Podcasts and go months without watching TV. Scanning the headlines on my News APPs is about all the shock my brain can handle. When not quilting I spend most of my time with family, babysitting grandkids (smitten!) or volunteering with my Church. My latest craze has been cooking with an Instant Pot. I love good food, but would rather be quilting than cooking I can hardly believe how fast and easy this appliance makes meal preparation! I especially like that I can use frozen meat, or unsoaked beans, and have dinner ready in less than an hour, with one pot for clean up. My kind of cooking! Here is the first recipe I tried, and believe me, it’s that easy. "An Instant Pot(R) makes an easy weeknight meal even easier! Frozen chicken breasts are combined with taco seasoning and salsa for a tasty Mexican-themed meal. You can use the meat for tacos, burrito bowls, or as a topping for baked potatoes. So many possibilities! I used this the first night for chicken quesadillas. The second night I used it as a topping for baked potatoes with shredded cheese, pickled jalapenos, and sour cream." with taco seasoning. Pour salsa and chicken broth on top. least 165 degrees F (74 degrees C). Shred the cooked chicken. It's so fun to get to know you. I love that we have spotlights to get to know each other. I loved reading about you Nedra :) You are pretty classy! I'm going to try that recipe.